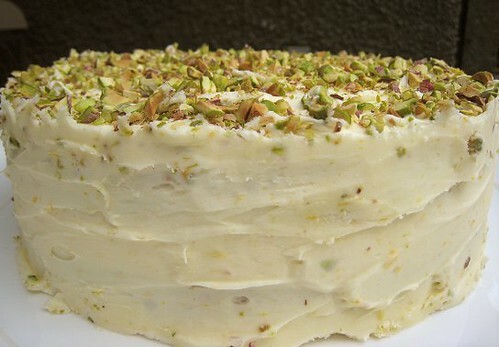 A few days ago, Boss #1 came up with the idea of making a cake. Naturally, CSC, his mother, complied. This was the very first time anybody in our household has made a layer cake! I guess we should thank Boss #1 for this. 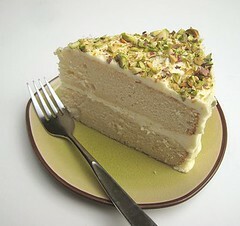 CSC made a recipe of All-Purpose Buttery Yellow Cake from America's Test Kitchen Family Cookbook. 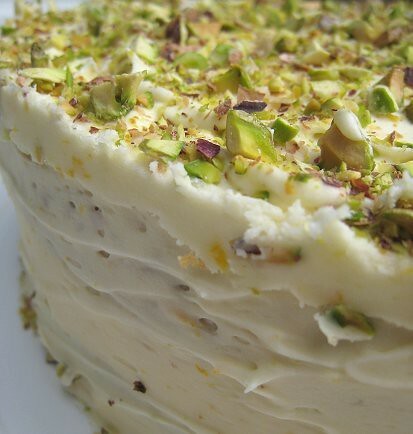 She then chose to make the Orange variation of Quick and Rich Vanilla Frosting. After all that hard work by CSC, I set to work decorating the cake. 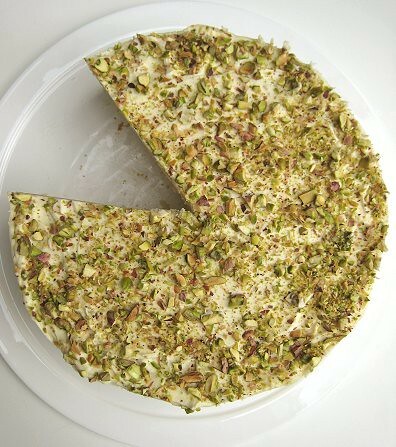 I was a bit at a loss on how to finish the top of the cake when I remembered the pistachios in the freezer. I shelled some and toasted them. 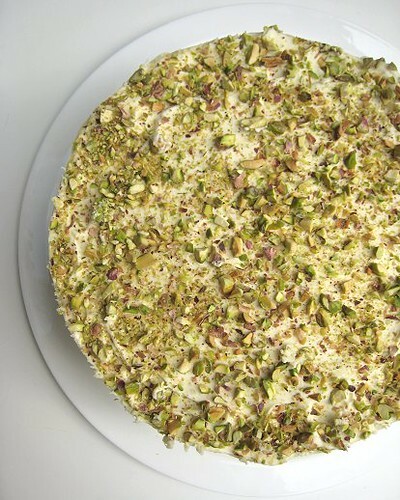 A quick run-through with the knife, then chopped pistachios rained on the cake. 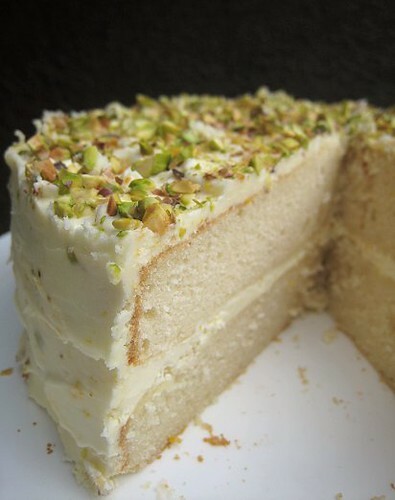 Warning: Gratuitous cake photos ahead. The ants took a big slice! 1. Adjust an oven rack to the middle position and heat the oven to 350F. Lightly coat two 8- or 9-inch round cake pans with vegetable oil spray, then line the bottoms with parcement paper. Whisk the flour, baking powder and salt together in a large bowl and set aside. 2. Beat the butter and sugar together in a large bowl with an electric mixer on medium speed until light anhd fluffy, 3-6 minutes. Beat in the eggs, one at a time, until incorporated, scraping down the bowl and beaters as needed. Beat in the vanilla. 3. Reduce speed to low and beat in 1/3 of the flour mixture. Beat in half the milk. Repeat with half of the remaining flour mixture, then the remaining milk, and finally the remaining flour mixture. 4. Give the batter a final stir using a ruibber spatula to make sure it's thoroughly combined. Pour the batter into the prepared pans and smooth the top. Bake until a wooden skewer inserted into the center of the cakes comes out with a few crumbs attached, 20-25 minutes, rotating the pans halfway through baking. 5. Let the cakes cool in the pans on a wire rack for 10 minutes. 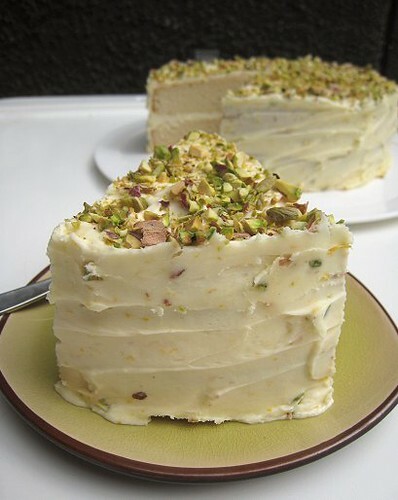 Run a paring knife around the edge of the cakes to loosen, then flip out onto the racks. 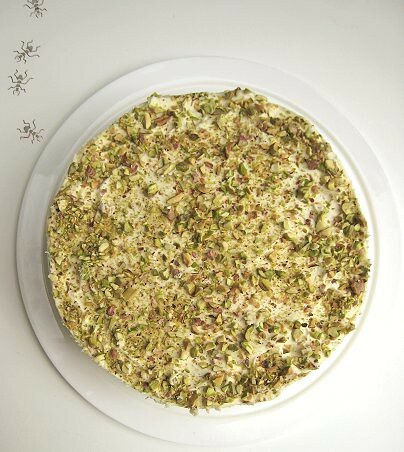 Flip the cakes upright, discard the parchment, and let cool completely before frosting, 1-2 hours. Stir the cream, vanilla, and salt together in a small bowl until the salt dissolves. Beat the butter with an electric mixer on medium-high speed until smooth, 30 to 60 seconds. Reduce the speed to medium-low, slowly add the confectioner's sugar, and beat until smooth, 2-5 minutes. Beat in the cream mixture. Increase the speed to medium-high and beaty until the mixture is light and fluffy, 4-8 minutes. Add 4 tablespoons fresh orange juice and 1.5 teaspoons grated orange zest to the heavy cream, vanilla and salt mixture. Wait, the last picture looks more like Pac-Man! the Filipino way as in goldilocks....not too sweet and uses less sugar? Confession: I haven't made a cake (other than cheesecake) in....about 5 years. You have ME beat!! Your creation looks just lovely. That cake looks really good! What a perfect slice! I bet those nasty ants have devoured that whole cake by now!!!! Loos so good!!! this is a beauty of a cake. 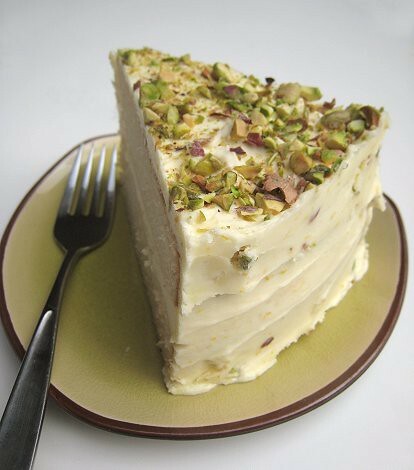 i LOVE the pistachios on top. soooo lovely! just be careful americas test kitchen doesn't reprimand you for copying one of their recipes and posting it online. a few years ago they were ruthless about this!!!! (google it, you should be able to read the post on it from an old blogger). Good job on your first layer cake! How did the cake taste? 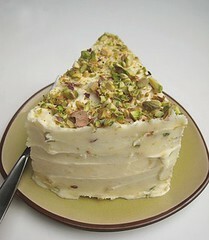 It looks more like a white cake...Interesting. It looks very moist as well. Haha, re PacMan... that's why I tried to angle it differently. Thanks! Well, I've tried decorating cakes before... but I usually don't actyully bake the cake myself... and I've never done layer cakes ever. And, this was CSC's firt attempt at baking a cake!